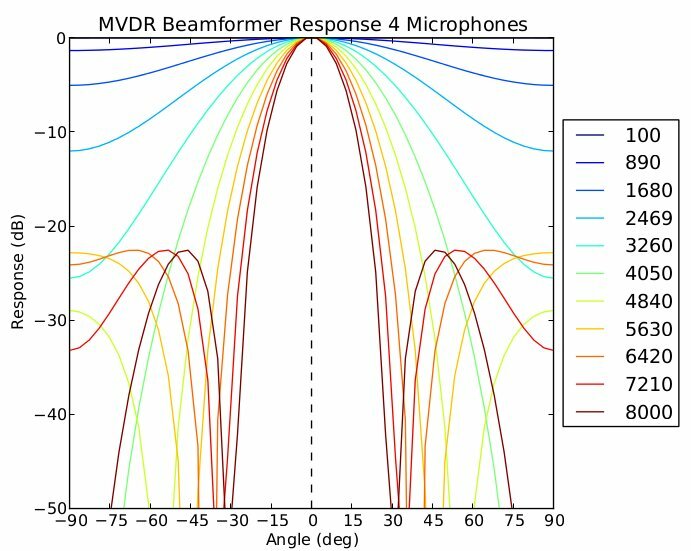 The MVDR Beamformer is a data adaptive beamforming solution whose goal is to minimize the variance of the recorded signal. If the noise and the underlying desired signal are uncorrelated, as is typically the case, then the variance of the recorded signal is the sum of the variances of the desired signal and the noise. Hence, the MVDR solution seeks to minimize this sum, thereby mitigating the effect of the noise. 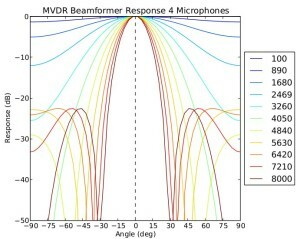 The MVDR beampattern is strongly dependent on the number of microphones and the length of the attached FIR filters. 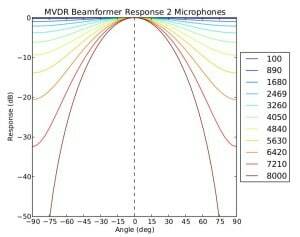 Here we will study the effect of changing the beamformer configuration. The beamformer is modelled as a uniform linear array with omnidirectional elements, the sampling rate is set at 16kHz, and the length of the attached type II linear phase FIR filters is set to 64. 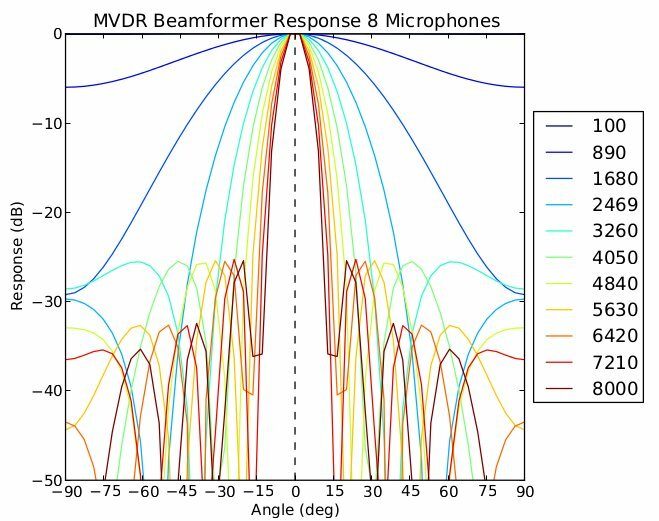 The results for the two microphone solution show that a two microphone MVDR beamformer has practially no spatial suppression ability. The mainlobe is 75 degrees around Nyquist, and the response is flat at lower frequencies. 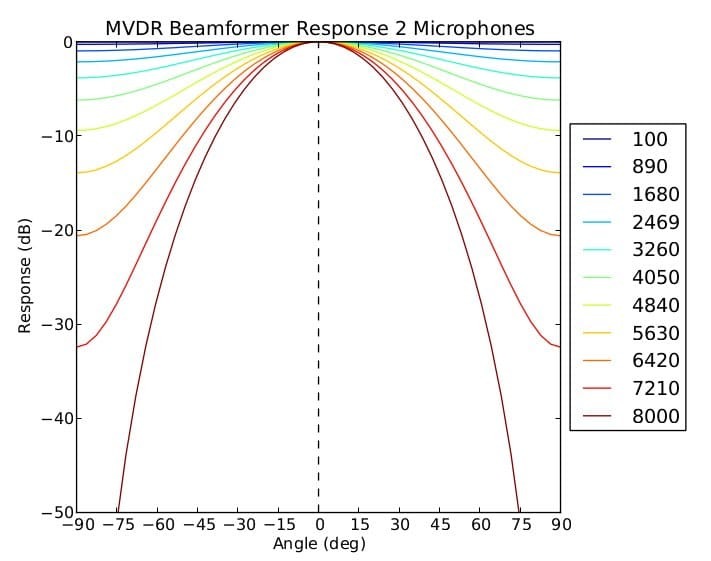 The two microphone solution still offers significant noise reduction across frequency bands especially when compared to simple delay and sum narrowband beamformers. Clearly the four microphone solution has sigificant improvements when compared to the two microphone solution. With four microphones, the MVDR solution has a mainlobe width of 30 degrees as the Nyquist frequency is approached, while the sidelobes offer close to 20dB of suppression. The mainlobe widens as the frequency lowers, but this time to a lesser extent than with the two microphone solution. 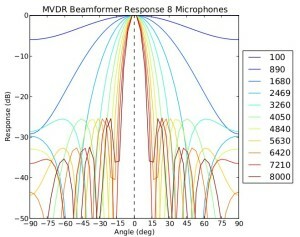 As the figure shows, the MVDR response is robust with eight microphones. The mainlobe is about 15 degrees as the Nyquist frequency is approached, and the sidelobes offer about 25dB of suppression. As the frequency lowers, the mainlobe gets wider, and the sidelobes get higher, but to a lesser extent than both the two and four microphone solutions.